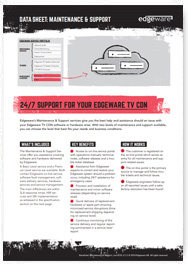 Edgeware’s 24/7 CDN support & maintenance service gives you the best help and assistance should an issue with your Edgeware TV CDN software or hardware arise. Both contain Edgeware on-line service, software fault management, software delivery services, hardware services and service management. The main differences are within SLA response times, HW services and SW implementation as adressed in the specification section on the datasheet.